I found out this morning that an industry presentation, scheduled for the 14th, has to be given tomorrow. That certainly changed my priorities for the day. Once I learned about the date change, I had every excuse to skip today's workout. I didn't skip the run, but it's almost as if I did. We got about 8 inches of snow yesterday, so an outside run was out of the question. I organized my materials and took a break at 9:00 AM to start the run. I hopped on the treadmill, set my speed, put on CNN and ran until the display showed 3.2 miles. No playing around with paces or inclines. No last quarter mile at an otherwise unsustainable speed. Just start, run and stop. Almost as soon as I hit the shower, the run was out of my head. I must have been thinking about the work I'd need to do over the next few hours. 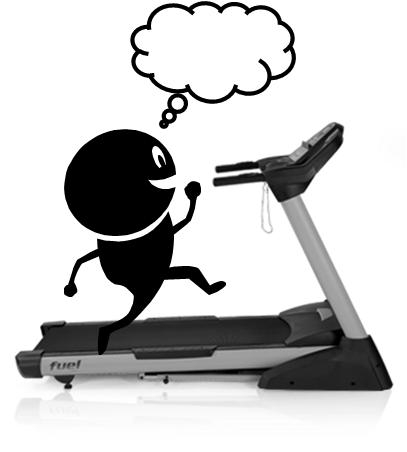 On the whole, I guess I'd rather have running amnesia rather than suffer through half an hour of treadmill tedium. Best of all, I won't have to give a presentation on Valentine's Day. That's great that you didn't skip the run even though it would have been easy and justifiable. I guess those treadmills come in handy. My month of no slacking lasted 4 days. Skipped my 7 miler today. One year I thought it would be a good idea for everyone to have their dentist appointments on Valentine's Day which meant whoever wasn't get picked at and drilled was sitting in the waiting room waiting or recovering. My ungrateful children called it the worst Valentine's Day ever. This is a really tough time for runners unless they have a treadmill or access to one. I don't blame you for skipping yesterday's run. No upside to doing that. Maybe we should all invest in snowshoes..